These Bearded Heroes are Fighting for Your Votes: Who Will You Send to the Finals? I hope you’ve recovered from the heart-pounding, beard-tingling excitement of round one, because round two is upon us. The people have spoken and EbolaMonkey, AlanAlvarado, SilenceIsACrime, and Aaron Leff are your round two competitors. All four crave victory, but only two will live to beard another day. Will you help your favorites triumph or let them suffer defeat? Update: The polls closed at 6pm EST. 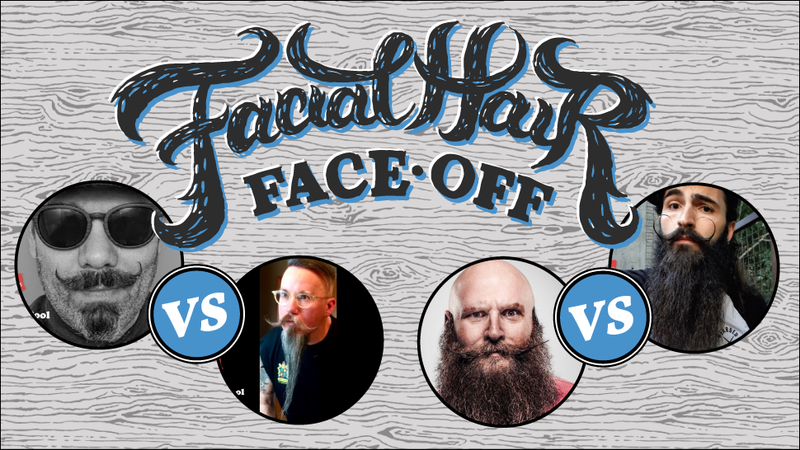 Be sure to support your fearless facial hair contestants in the finals on September 29 at noon EST! No one said choosing a facial hair champion would be easy. With this level of talent, it’s really any moustache’s (or beard’s) game. The competition is definitely heating up, but Hanes X-Temp™ technology is keeping our contestants cool, dry, and ready for battle. You, on the other hand, have two beard-wrenching choices to make. Will you help EbolaMonkey’s underdog moustache and eccentric sunglass choice earn another heartwarming upset? Or will the harmonious symphony of AlanAlvarado’s beard and moustache duo once again turn the tides for a hard-fought win? Then we’ve got SilenceIsACrime’s expertly styled moustache and voluminous beard. Will his ZZ Top style and pleading eyes tug your heartstrings enough to win your vote? Or will Aaron Leff’s bear-of-a-beard defeat another fan favorite in another upset? He earned his place in round two, but we’ll never forget #beardbaby. Only two will move one step closer to the title of champion and the chance to bask in the presence of bearded greatness at the National Beard and Moustache Championships. The polls close Friday at 6pm EST so vote now for the coolest of them all! When the heat is on, the blood gets pumping — and by blood I mean sweat...flowing freely from pores you didn’t even know you had. It’s hard to rep your hairy pride if there’s a thick layer of body hair that feels like a sauna suit. Or at least it was before Hanes X-Temp™ technology was developed to ease hairy guys’ suffering. It evaporates sweat quickly to keep even the hairiest among us cool and comfortable in their t-shirts, underwear, and socks. Now you can go on with your furry self and get weird with your beard even when the heat is on.